Best BOB Strollers - These are our Top 10 Picks For 2019! In this post, we’re going to review what we feel are the best BOB Strollers in the USA for 2018. 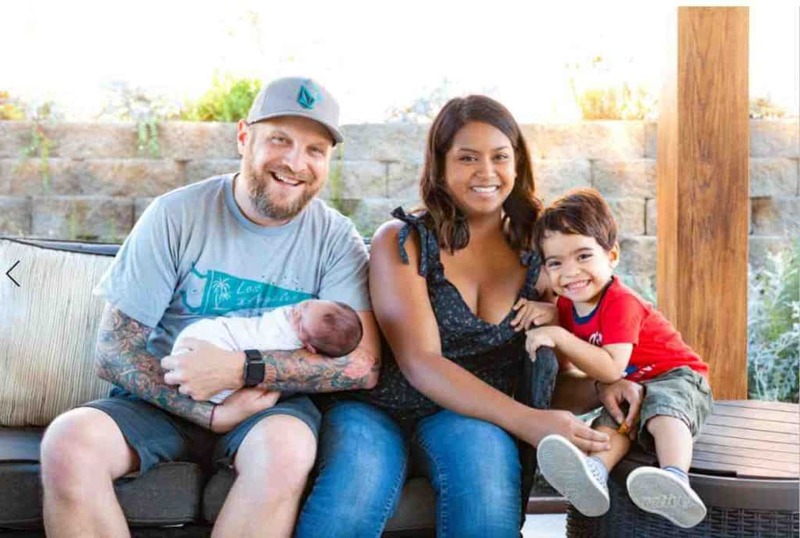 Founded in California over twenty years ago, BOB is one of the leading stroller and baby products manufacturers in the USA. The brand also has a formidable presence in other countries such as Canada, Australia, New Zealand and several European nations. BOB Strollers was born out of a passion for adventure and the great outdoors. In 1994, it was formed by an airline mechanic named Philip Novotny met Roger Malinowski, a bicycle industry genius. Philip had built a versatile, lightweight bike trailer and named it the Yak. Roger liked the concept and the two partnered up to produce it on a larger scale. People simply loved the Yak! It was unique and forever changed how bicycles transported gear. The two had initially named the business ‘Beasts Of Burden’ but the tedious moniker was later shortened to BOB! When Roger and Philip had kids, they began to design strollers with the capacity to go almost anywhere while still being practical and comfortable. Their strollers were very well received and so they kept on innovating. The Duallie double stroller, introduced in 2001 was a great success. BOB was also the first company to introduce the swivel-locking front wheel in 2005. The model was aptly called the ‘Revolution’ and it took stroller maneuverability to a whole new level. In 2011, Bob (now known as BOB Gear) was acquired by Britax, a company with over 80 years of experience in manufacturing premium car seats, strollers and accessories. BOB strollers are now more refined than ever – no wonder they’re the top choice for thousands of families from all over the planet. 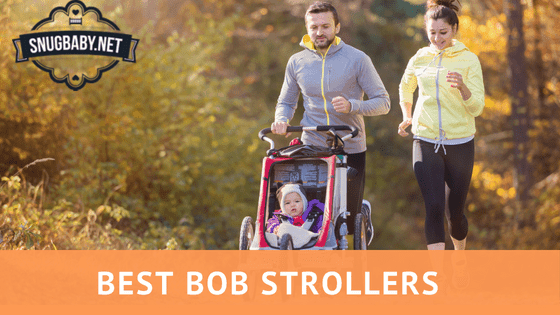 With an amazing lineup of Jogging Strollers and Double Jogging Strollers, BOB is defintiely worth considering! This is the official stroller of the Ironman Triathlon. In Fact, Ironman.com has loved these and been recommending them for YEARS! My advice, if you’re looking for a solid SINGLE jogging stroller, pick this up from Amazon now, you can’t go wrong with it. This wonderful specifimen of a jogging stroller has been designed for people with a serious athletic inclination but it also works well for parents who simply like to take long walks. The 3 wheel configuration is perfect for sprinting and endurance training. The front wheel is fixed for added stability, even at high speeds. • Advanced suspension. Offers three inches of travel and two weight support modes for a super smooth ride. • Adjustable handlebar with 9 positions is perfect for users of different heights. • Hand activated, bicycle-like front caliper brake lever on handlebar allows for excellent control when going downhill. • 16 inch air filled tires and aluminum alloy wheels enable stroller to achieve high speeds. • Comfortable seat with safety harness reclines almost fully flat. Large canopy protects baby from the elements. Sizeable storage basket is big enough for supplies. Wheels release quickly for compact storage. • Simple 2-step fold. Max weight 75 pounds. • Air pump, child tray and other accessories need to be purchased separately. This package includes the Rambler stroller and BOB weather shield for single strollers. The stroller is built on a robust aluminum frame. It is sturdy and yet weighs only 25 pounds. • Three wheel design is ideal for jogging. Swivel locking front wheel enables stroller to take tight turns and keeps it stable even on rough terrain. • 12 inch air filled tires and impact resistant polymer wheels tackle bumps with ease. • Mountain bike-like suspension with 3 inches of travel ensures a plush ride on all surfaces. • Seat reclines to multiple positions. 5-point safety harness keeps occupant secure even at high speeds. UPF 50+ canopy shields against harmful UV rays. • Transparent Shield prevents bad weather from playing spoil-sport. • Stroller is compatible with BOB infant car seats by Britax and also with other major brands. The three-wheeled Duallie Revolution (double jogging stroller) features two seats in side-by-side arrangement. Each seat can accommodate a child weighing up to 50 pounds. This is a best-selling model due to its loads of convenient features and premium build quality. • High grade suspension setup – 2 weight support of stages and 3 inches of travel. • Accessories must be purchased separately. • This is a double stroller so naturally it is quite bulky and heavy. A full-fledged, feature-packed jogging stroller that is ever ready to tackle any surface. The Revolution FLEX is in high demand among fitness oriented families. • 12.5 inch swivel-locking front wheel and 16.5 inch rear wheels. • Pneumatic tires with tubes and Schrader valve are handy on any terrain – beaches, country trails, pavement, shopping centres, cobbled streets and so on. • Comfortable seat with overhead canopy. Parent pouch and storage basket. • Accessories are optional extras. 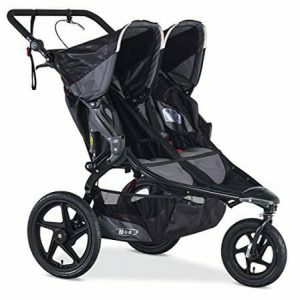 Yet another best-selling double jogging stroller with the seats in a tandem (side-by-side) setting. The Revolution Pro Duallie is equipped for intense exercise sessions or just a long stroll with your kids. • Hand-activated brake for precision braking and downhill control. This is a highly appreciated feature as the stroller weighs close to 150 pounds when fully loaded. • State-of-the-art suspension for a luxurious ride even on uneven surfaces. • Can be converted into a travel system. Accepts Bob B-safe infant car seat and several other popular makes. • Swivel-lock front wheel and larger rear wheels for stability. This stroller comes with a lot of bells and whistles such as a Stroller Strides fitness classes coupon. It also includes a Stroller Strides Fitness kit, which is made up of a handlebar console, exercise manual and resistance bands by SPRI. • Works on any type of terrain thanks to larger air-filled tires and polymer wheels. • Works for people of all heights. 9 handlebar positions to choose from. • Handlebar console is quite useful for storing keys, change, cup-holder etc. • Nothing much to be honest. Tires need some maintenance. BOB just keeps banging out bestseller after bestseller! The Revolution PRO is a highly sought after model in the BOB lineup. 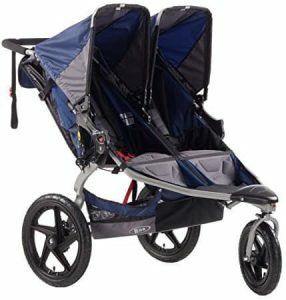 • Extremely well-built all-terrain jogging stroller. Can handle snow and ice-covered pavement with ease. • Stroller is travel system ready. Adapter to be purchased separately. • Max weight = 75 pounds. • Buyers must also buy air pump to fill tires with air periodically. Compact and lightweight stroller weighs less than 25 pounds. Meant predominantly for use within city limits but can handle the occasional off-road patch. In closing, Which BOB stroller was your pick of the lot? Please share your thoughts and opinions in the comments below!